The fifth Member of the Soccer Fitness 20 MPH Club, Adam performed two separate, 4-second runs at or above a speed of 20 miles per hour on Thursday, May 19, 2011. 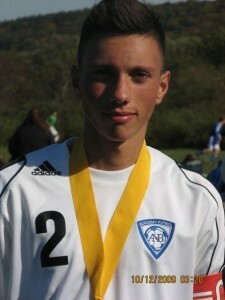 A 6 foot tall defender with the ANB Futbol Academy, Adam has been training with Soccer Fitness for the past three months, and will be traveling to Europe with the Academy in the summer of 2011. At only 15 years of age, Adam has already reached an impressive top speed of 21 miles per hour, and we expect him to continue to improve his running speed in the next few years. We at Soccer Fitness would like to congratulate Adam, and we look forward to continuing to work with him throughout his soccer career!